A month of tension, drama, joy and agony at our house came to a somber end last night when Salvy Perez made the last World Series out after swinging at three pitches out of the strike zone. It was a maddening way to end a tremendous run for the Royals. But, then again, they might not have been playing for the last month had Perez not driven in the winning run — on another pitch out of the strike zone — in that unbelievably wild Wild Card playoff game against the Oakland A’s on Sept. 30. Perez’ futile, final attempt to tie Game 7 will stay with me a long time, but there are three other images that are also seared into my head. 1) Kansas City’s (well, Prairie Village’s) own Joyce DiDonato singing the National Anthem before Game 7. Joyce, 45, is obviously a tremendous singer, but in addition she has a powerful and stunning presence. On Wednesday morning, on Steve Kraske’s “Up to Date” show, Joyce had talked about how she would approach the song and the moment. 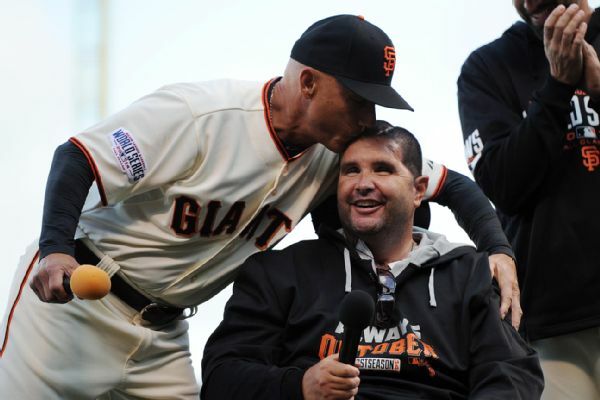 2) Before Game 4 in San Francisco, the Giants had a very special person deliver the “Play Ball!” cry at home plate. He is Bryan Stow, the former paramedic and Giants fan who was beaten in a Dodger Stadium parking lot after opening day of the 2011 season. He suffered brain damage and is now in a wheelchair. Giants’ relief pitcher Jeremy Affeldt, who got his start with the Royals, has become a friend and benefactor of the Stow family, and third-base coach Tim Flannery has played concerts to help defray the cost of his extensive care. Earlier this year, I saw video clips of the sentencing of the assailants, Louie Sanchez and Marvin Norwood. 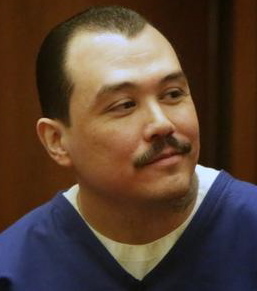 The main attacker, Sanchez, not only showed no remorse but actually smirked during part of the hearing. What kind of man? Just as cowardly as he was by jumping in. Sanchez was sentenced to eight years in prison; Norwood to four. 3) The final image that will haunt me — as well as tens of thousands of other Royals fans — is that of Giants’ rookie second-baseman Joe Panik making his diving stop of Eric Hosmer’s hard-hit ground ball up the middle of the field last night and then his glove flip of the ball to shortstop Brandon Crawford. Crawford stepped on the bag to force Lorenzo Cain going to second and then threw to first to double up Hosmer. The play at first was so close that it had to be settled by video replay. If the ball had gone through to center field, as appeared almost certain, the Royals would have had runners on first and third with no one out. Instead, it was two out, bases empty. Relatively early in the game though it was, that was the dagger in the gut. Panik even surprised himself, telling reporters after the game he had never made a glove flip from the prone position. “Once in a while in practice or B.P., I’ll do a glove flip standing up, but nothing like that on my belly. It was just instinctual. I couldn’t get my bare hand to the glove because it was Lorenzo Cain running and I’m like, ‘He’s fast,’ so I just tried to get it” to Crawford. It was the Panik play that kept going through my mind between restless bouts of sleep last night. Today, though, I’m going to try to put it behind me. I’m going to focus, instead, on that beautiful blond opera star from Prairie Village and her soaring voice, which brought tears to my eyes last night. Thank you, Joyce! And congratulations, KC Royals, on a stupendous season! I don’t know about worldwide quality, but, yes, The Star is a damn good paper…even in its much diminished, basement-budget state. Still, the number of people who share letter writer Stewart Grant’s sky-high opinion of The Star is obviously dwindling, as the most recent circulation figures clearly indicate. According to the Alliance for Audited Media — formerly the Audit Bureau of Circulations — The Star’s circulation, like that of many other metropolitan dailies, continues to slip badly. And that’s the case even when digital subscriptions are included. The Star’s average Sunday circulation went from 254,111 in the fall of 2013 to 242,583 as of the end of last month. Over the last five years, the Sunday drop-off has been a startling 27 percent — from 307,794 in 2009 to the current 242,583. It’s just about the same story for average Monday-Friday circulation, which fell from 216,226 to 155,465 — 28 percent — between 2009 and this year. …As a side note, it is puzzling to me that The Star, in a metropolitan area of about 2 million people, has a larger circulation than the Post-Dispatch, which is in a market of about 2.8 million. But, then again, maybe that speaks to the difference in quality between the two papers. It seems to me — and from what I’ve heard — the quality of the Post-Dispatch has suffered more than that of The Star since both were sold in the mid-2000s. One problem for traditional newspapers, of course, has been the proliferation of free news and opinion outlets. But another problem, in my view, is that a defeatist attitude has set in at the corporate offices of chains, like McClatchy and Lee Enterprises, the owners, respectively, of The Star and the Post-Dispatch. McClatchy, based in Sacramento, and Lee, based in the Davenport, IA, made big mistakes by expanding when powerhouse operations like KnightRidder (owner of The Star and others) and Pulitzer (the Post-Dispatch and others) saw the writing on the wall and realized it was time to get out. Now, those upstarts-turned-suckers are licking their wounds, mired in huge debt and paralyzed by fiscal fear. They don’t dare invest more in their properties because, being publicly owned, it might well cut further into the value of their stock. If I was calling the shots at McClatchy, however (and willing to put my neck on the line), I would roll the dice and get aggressive. I think that investing in the product — bolstering the editorial side by hiring more editorial employees and embarking on well-developed marketing campaigns — could beget turnarounds in some markets, including Kansas City and St. Louis. These are tremendous markets, and their respective newspapers represent, by far, the most powerful news-gathering organizations in their respective regions. I don’t see any reason why they couldn’t gain ground and sell a lot more subscriptions, particularly digital. The reality, however, is that the chances of significant, renewed investment by McClatchy are infinitesimal. The only hope for resuscitation is a change of ownership — and not ownership by another chain. As an example of what can happen, look at The Washington Post. Jeff Bezos, founder of Amazon, bought the paper in 2013, taking it private. At first everyone was wondering what he would do with the paper and if he would take it in some new, crazy direction. He didn’t. He stuck with what has worked best for newspapers over centuries. This year, he gave the green light to the hiring of more than 100 new employees. The resulting editorial revival and financial stability have catapulted The Post back into national prominence. Again, The Post has been able to recapture lost ground through the emergence of a wise and wealthy purchaser who was willing to invest in the product. With McClatchy and Lee, on the other hand, we can expect them to sit on their hands and watch their properties continue to atrophy. It’s not a happy prospect. But let’s hold out hope that a Midwestern version of Jeff Bezos recognizes what a golden opportunity exists in our community and decides to free The Star from the clutches of its sodden Sacramento owner. Same for the Post-Dispatch; it’s too good of a property in too good of a market to be stuck in the hands of Lee Enterprises. It, too, needs and deserves rescuing by someone who recognizes value and has the money to pull it off. As most of you know, I wrote last week about the problem that many men have picking out suitable attire, if they don’t have a female fashion consultant, be it a wife, girlfriend, sister or just plain friend — someone, anyone who doesn’t want you to look ridiculous. Today I want to cite an example of someone who not only needs a fashion consultant but also needs to — as the old saying goes — get a life. 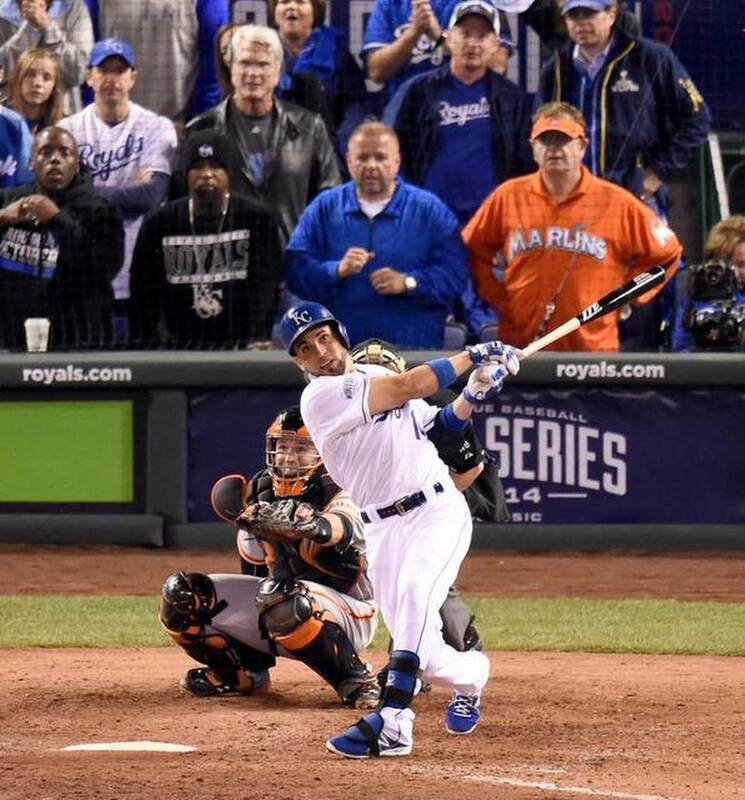 I speak of “Marlins Man,” the goofball who has sat in the first of second row of each World Series game, wearing an orange Florida Marlins jersey and an orange Marlins visor, which he usually wears cocked to one side. This guy is strictly an exhibitionist, who is paying thousands of dollars per game to be seen on national TV. He’s a lower-key version of “Rainbow Man,” who, in the ’70s and ’80s wore a rainbow, Afro-style wig and held up signs reading “John 3:16” at various sporting events. That guy, Rollen Stewart, was a certified nut case, who now is serving three consecutive life sentences in prison on kidnapping charges. “Marlins Man,” on the other hand, is just a guy with too much money and much time on his hands. His name is Laurence Leavy, and he’s a 58-year-old Miami attorney. He has attended major sporting events for years, but I presume it’s just this year that he has begun to seek out the cameras in a major way. Here’s how he explains his odd obsession. See what I mean? No wife, almost certainly no girlfriend…no guidepost…no social compass. After the World Series ends and he goes back to Miami, about the best thing Laurence Leavy will have is TV recordings of himself sitting in the first row at Kauffman Stadium and the second row at AT&T Park. Wow. What a thrill. Critical as I am of Mr. Leavy, I have to admit that I have my own fashion fixation — one that I’m not particularly proud of but that I just can’t and won’t give up. I speak of plaid pants. Over the years, after having been out shopping on my own, I have come home with various pairs of plaid pants — some sublime and some outrageous. Each and every time, Patty has rolled her eyes and shaken her head. And whenever I get bold and put on plaid pants to go out to an event with Patty, she immediately waves me back to the bedroom for redressing. 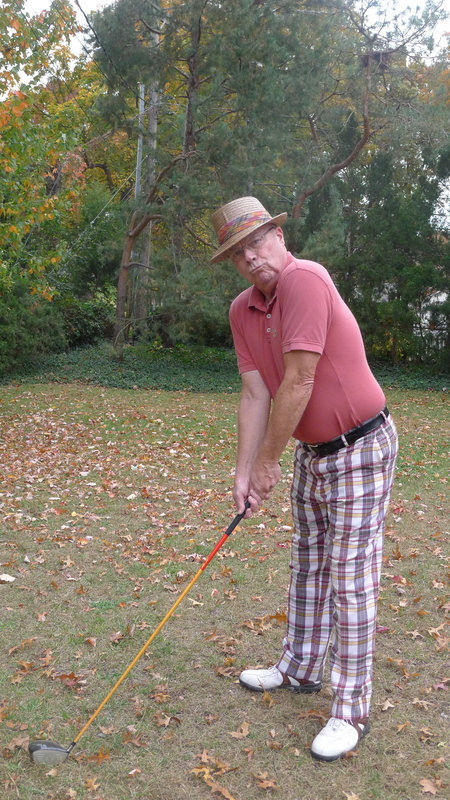 So, we have come up with a deal of sorts: She will not object if I wear plaid pants on the golf course, or maybe to a Halloween party. Of the three pairs of plaid pants that I own, my favorite is the enviable, eye-catching pair of golf pants that you see below. After I bought them and took them to the tailor shop in Brookside for alteration, the shop owner’s wife — a seamstress who happens to be a blond bombshell — gave the pants an enthusiastic endorsement. I’m sure you can see why! A few weeks ago, though, I had a big scare: I went to the closet to get out the pants for a round of golf, but I couldn’t find them. I looked everywhere (well, almost everywhere), including going to the cleaners to see if I might have left them there after the last cleaning. No luck. I had just about written them off, when, one day, I looked in the bottom of my closet and saw the blue laundry bag where I put the clothes that are going to the cleaners on my next trip. I noticed that the bag had a slight lump, and when I opened it up — hooray! — there were my golf pants. The only thing I can compare my relief to was a certain night in the spring of 2006. I was lying in bed in an Oklahoma motel, thinking about my future and listening to “country legends” music. All of a sudden, it hit me: it was time for me to retire from The Star. …That’s how relieved I was to find those pants in the bottom of my closet. And that’s just what Patty and I did last night, when we went to the Kansas City Symphony concert instead of staying home and watching the third game of the World Series. Our friends Tom and Pat Russell had invited us to the concert weeks ago, and we accepted, having no idea, of course, that the Royals would still be playing and that the event would fall on a World Series night. There was no copping out or turning back, of course, and, besides, the program looked great: Richard Wagner’s Overture to The Flying Dutchman; two pieces to be performed by the Symphony Chorus, backed by the orchestra; and a Felix Mendelssohn symphony. Now, you’d think that it would be difficult to build a bridge between the World Series and a symphonic concert, but our genius of a music director, Michael Stern — a true Kansas City treasure — made it look as natural a combination as mortar and brick. The house — peppered with empty seats, even right down front — erupted in laughter. He didn’t divulge the score, saying he was deferring to some people who were recording the game to watch it later — but gave a hint: “Things are going well,” he said, or something to that effect. The score at the time, of course, was 1-0 Royals. 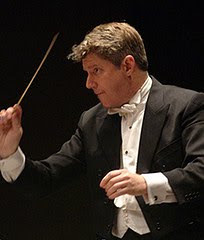 Then out came the irrepressible Stern who has led the Symphony for 10 years and has shown himself time and again, especially at the Union Station Memorial Day Weekend concerts, to be a man of the city. At intermission, people streamed to the lobby, checking their cellphones. When we first left the seats, the score was 3-0 Royals in the top of the sixth inning — which told us that Royals pitcher Jeremy Guthrie was having his way with the Giants. But by the time intermission ended, it was a different story. The Royals were leading 3-1, but Kelvin Herrera had been brought in to relieve Guthrie in the bottom of the sixth, and the Giants had runners on first and second with no outs. Yikes!! But then the ushers started playing the portable chimes, directing us back into Helzberg Hall. Weighed down with unease, we returned to our seats. As I sat nervously in my seat, I kept telling myself there was not a thing I could do about the game and that I should do everything I could to put it out of my mind and enjoy the music. I would find out what happened soon enough. Fortunately, the post-intermission piece, Mendelssohn’s Symphony No. 3 in A Minor, was a blockbuster. It had a red-faced Stern vigorously punching the air at various points, eliciting smashing musical exclamation points, and featured an enrapturing solo by principal clarinet player Raymond Santos. And, yes, the music did what I had hoped, sweeping me away from the torturous thoughts of whatever might be going wrong for the Royals at AT&T Stadium in San Francisco. Stern put the capper on the show, when, after the first round of a standing ovation, he returned to the stage wearing — what else? — a Royals jersey. 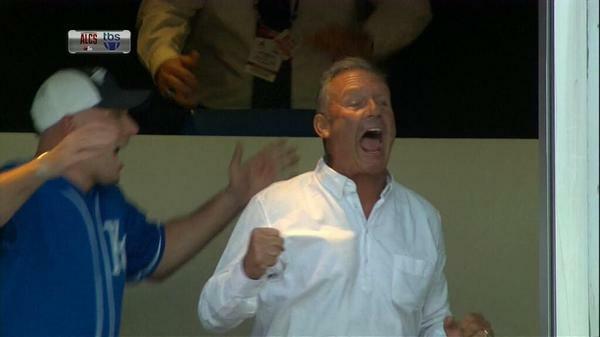 As we filed out, we saw, happily, that the Royals led 3-2 in the eighth inning. After a long trek to the car, on the lowest level of the Kauffman Center garage, we immediately switched on the radio, to hear that the Royals went down in order in the top of the ninth. That brought up Royals’ maestro Greg Holland, to handle the bottom of the ninth. We hung on every pitch, as we listened to Denny Matthews’ low-keyed call of the game and waited for traffic to clear to get out of our parking spot. One-two-three, down the Giants went, and, as we high-fived in the car, the parking garage resonated with a victorious chorus of honking horns. And then we concert-goers went out into the night, going our different directions but all thinking the same thing: Our Royals are within two wins of taking the World Series. Saturday night, as Patty and I were getting ready to go out with two other couples to Le Fou Frog, I asked her for some sartorial advice. I picked up a brand-new pair of Tommy Bahama, sand-colored jeans and asked her if they would be appropriate. “Ok,” I said and put the Tommy B’s back in the closet and got out a pair of gray slacks. That wasn’t the end of the conversation, though. “I don’t know what would have happened to you if you hadn’t gotten married,” Patty observed. “I would still be wearing brown and hanging out at Harry’s Bar and Tables,” I said, referring to the place where we met (then called The New Stanley) in 1983. That’s a windy lead-in to my subject today: Why many men, when left to their own devices, cannot seem to make good fashion choices. Taking it a step further, some of the worst offenders are some of the highest-ranking men in my former church — the Catholic Church. I have never understood why many bishops find it necessary to wear flamboyant regalia at some liturgical functions. It just doesn’t seem to square with the image of Christ, who made a habit of reaching out to those of the lowest social stations — the poor, people with infirmities and disabilities, even prostitutes. 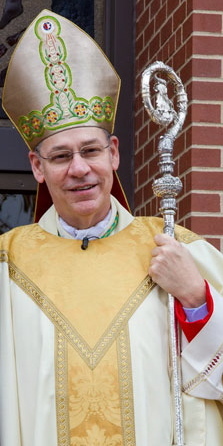 To show you what I’m talking about, below is a photo of Kansas City-St. Joseph Bishop Robert Finn wearing his mitre (big hat) and holding his crozier (ornate staff). He loves that hat and staff and, like many bishops, breaks them out frequently. But think about it…How often do you see images of Jesus carrying an ornate staff and wearing showboat headdress? Never, right? Sometimes he’s pictured holding a walking stick, and the only head gear I’ve ever seen him depicted with is a crown of thorns. So where did the bishops get the idea that mitres and croziers were appropriate, or in some way helped instill in the laity the importance of loving God and loving your neighbor as yourself? 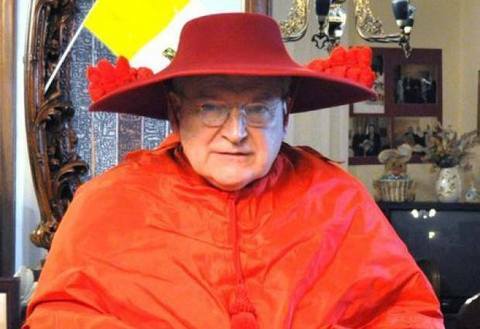 It should come as no surprise, then, that in recent months, Francis has stripped one of the most ostentatious clerics, Cardinal Raymond Burke, formerly the archbishop of St. Louis, of two key posts. Last December, Burke, a leader of the church’s conservative wing, was removed from a prestigious Vatican congregation that helps the pope select new bishops. And just last week he confirmed in an interview with BuzzFeed that Pope Francis is planning to remove him from as chief justice of the Vatican’s Supreme Court. I said he was ostentatious, and these photos will illustrate what I mean. While the mitre and crozier are satisfactory for some high-ranking Catholic officials, Burke’s tastes run to a different level. 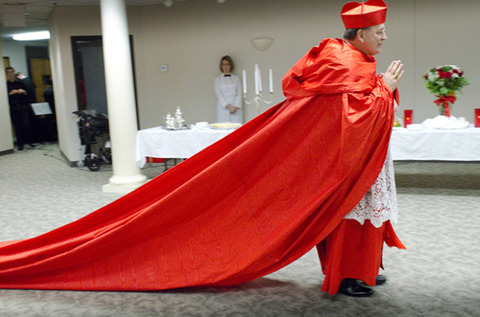 Here he is, for example, in something called the “cappa magna,” or great cloak. Now, back to that Saturday evening conversation with Patty…If I had not married her, yes, I might still be wearing brown and hanging out in the Westport bars, looking like a 1970s relic. But I’ll tell you one thing: I wouldn’t be wearing a big red hat and a cappa covering my assa. How great it is to be a Kansas Citian!!! Every day is a good day to be a Kansas Citian. But today it’s extra special to be a Kansas Citian. To watch these Kansas City Royals grow and mature and fight and claw the last two seasons has been a tremendous thrill. And to hear David Glass, Dayton Moore, Ned Yost and the players give so much credit to the fans of Kansas City and say they won it for us, well, that’s just intoxicating. I have never seen players celebrate with the fans like these players have. Back in ’85, when we won it all, I do not recall any intermingling between the players and the fans after the game. After the on-field celebration, the celebration moved into the clubhouse and stayed there, I’m pretty sure. But these Royals, they come at things differently. They understand our suffering through decades of losing and not even being competitive. They understand partly because they have worked so hard to get over the hump, to jell into a winning unit. They have persevered through doubt (ours) and disillusionment. The mutual embrace with the fans first evidenced itself in a big way after the post-season-insuring win in Chicago a couple of weeks or so ago. After spraying volcanic amounts of champagne in the clubhouse, several Royals continued the celebration with a few hundred Royals fans who had converged behind the visitors dugout and decided to stay for a good long while. The we’re-all-in-this-together-spirit was just getting started. It went to a new high with the $15,000, player-financed splurge at McFadden’s after the Royals knocked out the Angels in the division series. The special chemistry that this team has was apparent last year, when the team came very close to making the playoffs. It held through the early part of this season, too, but, then, when things were going bad, Billy Butler, who was really struggling for a while, got snippy with first base coach Rusty Koontz at one point and exhibited resentment at Yost for indicating favoritism for first baseman Eric Hosmer over him. I was afraid the chemistry might crumble. But fate stepped in; Hosmer got hurt, Billy played well in his absence, and harmony was restored. As he did all year, Yost let the players flout their distinctive styles and personalities, and he let them know through all the ups and downs that he fully believed in them and their combined talent. As the team gained confidence, the fans’ confidence in the team mushroomed, and here we are, floating on air and cheering for a once-in-a-generation-or-so group of players who are irrepressible…and maybe unbeatable. Get out the bottle rockets and cherry bombs; a formerly great newspaper is mounting a big comeback. With all the grim news about the newspaper industry, it’s great to hear something positive, and David Carr of The New York Times gave credit where credit was due in his most recent “Media Equation” column. The paper he singled out was none other than The Washington Post, which took journalism to a new plateau when it broke and put a stranglehold on the Watergate story in the 1970s. During the last 10 to 15 years, however, with the proliferation of free, online content, The Post drifted down to yawning status, even as its once-biggest competitor, The Times, stamped itself as a genuine national newspaper, along with the Wall Street Journal and USA Today. Recently, though, The Post has mounted a major comeback. A major scoop was the story of how deeply the White House fence jumper was able to penetrate the White House, after the Secret Service had issued a statement making it sound like he was apprehended just inside the door. In retrospect, The Post’s turnaround can be tied to its expose in 2013 about the longer-than-understood reach of the National Security Agency. Based on information leaked by former NSA contractor Edward Snowden, The Post laid bare for the public the existence of several global surveillance programs that further shattered Americans’ sense of diminishing personal privacy. Then, a little over a year ago, Jeff Bezos, founder of Amazon, bought The Post for $250 million and took it private. That move prompted speculation about what direction Bezos might take The Post. At the time, though, Bezos, who is 50, gave a strong indication that the newspaper would not stray far from its longtime course of striving to be one of the nation’s foremost newspapers. In that atmosphere of stability, the quality of the journalism has improved with Terrance Gore-like speed. 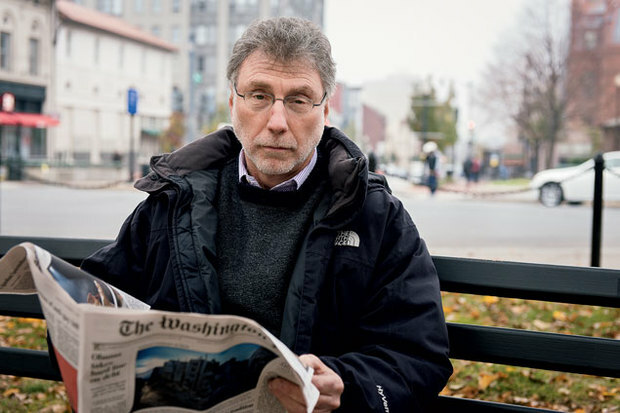 Another factor in The Post’s comeback, Carr said, was the 2013 hiring of editor Martin Baron, who had established himself as a strong leader at several other papers he worked at earlier. Amen, brother. There are so many newsrooms now — including The Star’s — where the employees are running scared because ownership has not been willing or able to invest in their newsrooms to insure aggressive pursuit of the news. As a journalist (oh, yeah, JimmyC still has his press pass; it’s just homemade now), I am thrilled to see that The Post is on the rebound. And on a personal note, it’s gratifying to know that two former former KC Star reporters, Tom Jackman and Joe Stephens, are with a paper that is headed in the right direction. Jackman is one of several reporters who covers Virginia for The Post, and Stephens is an enterprise/investigative reporter. Currently, Stephens divides his time between writing for The Post and teaching journalism at Princeton.